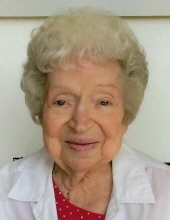 Delphine D. Whitesock, age 90, February 9, 2019, of Livonia. Beloved wife of the late Joseph. Loving mother of Joseph M. (Susan) Whitesock, Dolores A. (John) Mauti and the late Mary Lou Bentley. Dear grandmother of 7 and great grandmother of 10. Sister of Donald Kowalczyk, Nancy (Eugene) Rogers and the late Sylvia (Ray) Day. Please share a memory of Delphine on her tribute wall. To send flowers or a remembrance gift to the family of Delphine D. Whitesock, please visit our Tribute Store. "Email Address" would like to share the life celebration of Delphine D. Whitesock. Click on the "link" to go to share a favorite memory or leave a condolence message for the family.